The Tehreek Labaik Ya Rasool Allah, Thursday (today), continued to protest outside the Punjab Assembly for the second day hampering traffic and creating nuisance for the commuters. The protesters staged a sit in demanding an early assassination of Aasia Bibi in front of Punjab Provincial Assembly yesterday (Wednesday). A spokesperson from Lahore CCPO office while talking to Pakistan Today said that negotiations with the charged protesters are underway. They party, however, vowed to continue to protest until the fulfillment of their demand. The charged protesters blocked the Mall Road at Charing Cross and caused a gridlock all over the city. 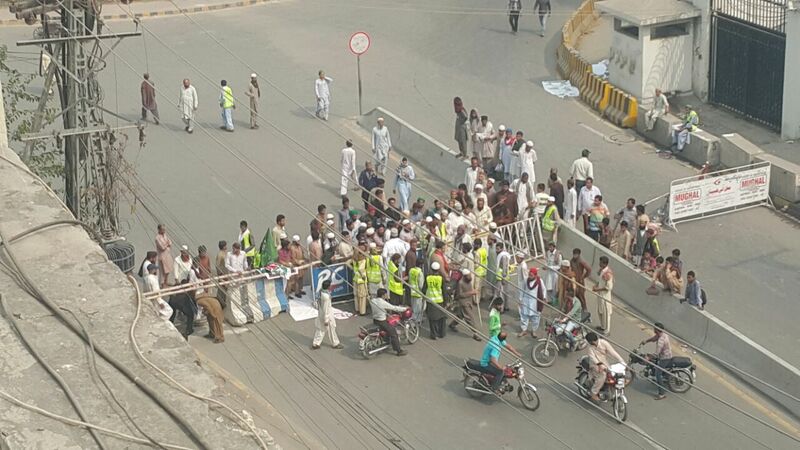 Commuters in Lahore faced immense hardship as road leading to Punjab assembly have been blocked i.e. from the Avari hotel to the Punjab Assembly and the Queens Road from Civil lines police station to the Charing cross. The protesters are checking all the passerby’s before allowing entry into the cordoned-off area. Resultantly, the Lahore High Court (LHC) has directed the Lahore District Coordination officer (DCO) on charges of contempt of court for allowing parties to demonstrate on Mall Road. The DCO would be held accountable for not complying with court order passed in 2011 that imposed permanent ban on protests at Mall Road. Earlier, hundreds of protestors led by different religious parties belonging to the Barelvi school of thought gathered at Charing Cross under the leadership of Allama Khadim Hussain Rizvi on Wednesday evening. The protestors reached the venue in form of a rally that started from Data Darbar after the Zuhr prayer. The protestors were carrying banners, flags and were chanting slogans against the government, alleging that the government had adopted an anti-Islamic agenda and it would not be acceptable under any circumstances. Addressing to the protestors Khadim Hussain Rizvi alleged that the government had failed to keep its promises which were made during previous sit in staged in Lahore and Islamabad. He said they had been forced to stage a sit in because the government was showing reluctance in hanging Aasia Bibi. “If the government can conduct a speedy trial in the case of Mumtaz Qadri, then why it is so reluctant in the case of Aasia Bibi. Aasia is a blasphemer and she must be treated according to the law,” he demanded and alleged that the government was involved in promoting un-Islamic trends in the country and the solution to all problems facing the country was in imposition of Shariah. Rizvi also accused the government of victimising members of the Tehreek, saying these tactics would not push them away from their mission. The protestors were also addressed by other leaders including Pir Afzal Qadri, Zaheer ul Hassan Shah, Peer Muhammad Ejaz Ashrafi, Qazi Mahmood, Pir Sarwar Shah and others, who also grilled the government. They said they were ready to face any hurdle in their mission. They vowed to continue their sit-in until their demands were met. They demanded immediate release of religious parties’ workers who were kept under bars in different cases while also demanded that the call for prayers be allowed on loud speakers. They stressed on the government to make the blasphemy Act (295-C) more effective. During yesterday’s protest, Dr Ashraf Asif Jalali was absent; who was the back bone of this movement which formed after the assassination of Mumtaz Qadri. Sources in movement said Pakistan Today that Dr Jalali had departed him from this movement after the leaders expressed anti-military opinions. During the protest, the volunteers also manhandled the shopkeepers as well as the pedestrians. Section 144 bars holding of protest rallies and political gatherings in the area but the district administration and Lahore Police were clearly helpless in implementing the Lahore High Court’s decision in this regard. In yesterday’s protest, electronic media was absent as per directions of PEMRA. What a shame that these blood thirsty individuals can hold a country to ransome. What sort of Sharia are they demanding—-the life of a woman?. Show mercy! . Our great prophet(bph) showed it all the way.